The Hippodrome Theatre and Plaza Cinema. In 1908 the building was taken over by Fred Karno who commissioned an architect to convert it into an Edwardian music hall, named the Hippodrome. It was opened on 2 November 1908. The main auditorium could seat 700 with a balcony and gallery seating a further 380. Charlie Chaplin is said to have appeared there, before he went to Hollywood. It was also used as an early cinema, giving Chaplin the chance to return, but this time on celluloid. Marie Lloyd and Harry Tate were two others who trod the Hippodromes boards. The first night performance "...opened to overflowing houses with a variety programme that won general applause from all parts of the house." Hippodrome Theatre then Plaza Cinema The Hippodrome, with both live shows and cinema, was competing with the Theatre Royal, just a few dozen yards away on the other side of New London Square. The Hippodrome was sold in 1929 to a Mr Vickery, from Taunton, who closed it and engaged architects Messrs Lucas and Langfords of Exeter to redesign the theatre into a cinema only. Messrs R C Lee and Co Ltd undertook the renovation, which included a gold proscenium arch around the screen. On 6th February 1931, the Hippodrome, now named the Plaza Cinema opened its 875 seats as a talkie cinema, with Mr Lattimer as the manager. The King of Jazz which featured a young Bing Crosby and utilised the recently developed 2 strip Technicolor system was the first film to show at the Plaza. In 1936, the rival Savoy (renamed ABC) was built to replace the New London Inn, giving Exonians two cinemas within yards of each other. A sheet of flame This grand old building would not survive the blitz of 4 May 1942 and a hit from a single high explosive bomb destroyed it and created a conflagration in the buildings all around. "......caused by a bomb which fell on the Plaza Cinema almost entirely demolishing the building. This building was a converted theatre of the old type and a very bad fire risk; the explosion caused a sheet of flame which seemed to envelop the premises immediately." Neither of the Plaza's nearest rivals, the Savoy/ABC, and the Theatre Royal survived the 20th-century. Fred Karno. Born Frederick John Westcott in Paul Street, Exeter on 26th March 1866. Fred was originally a slapstick comedian credited with the invention of the "custard pie in the face" gag and the man who gave Charlie Chaplin and Stanley Jefferson (Stan Laurel) their first chance in show business. Although the family had moved to Nottingham by the time Fred was nine years old, he always said "Devon born and proud of it". He was indentured to a plumber for 7 years. Fred joined an Exeter gymnasium after doing some repairs there - a natural athlete he was soon winning prizes at local fêtes. He joined with a juggler to become Alvene and Leonaro in a circus. This led to pantomime and another collaboration with gymnasts Bob Sewell and Ted Tysall as the Three Karnos. He started calling himself Fred Karno, although he didn't change his name by deed poll until 1914. By the 1890's Karno started to concentrate on promoting slapstick comedy acts using a range of different performers. He first appeared on stage with a young Charlie Chaplin in 1901, after Syd Chaplin, who was an employee, had persuaded Fred to take his young brother on. By 1906 he was promoting 32 different sketches around the country. Fred became so successful that he turned his house in Vaughan Road, London into the Fun Factory, a headquarters for nurturing new talent, storing props and managing acts. He can be credited with discovering Max Miller, and Flanagan and Allen although his most famous discoveries are Charlie Chaplin and Stan Laurel. It was in 1908, Fred Karno leased his first theatre, the old Royal Public Rooms in London Inn Square, Exeter, renaming it the Hippodrome. Bedford Circus a classic Georgian terrace which like so much of the city was destroyed in the 1942 Blitz. 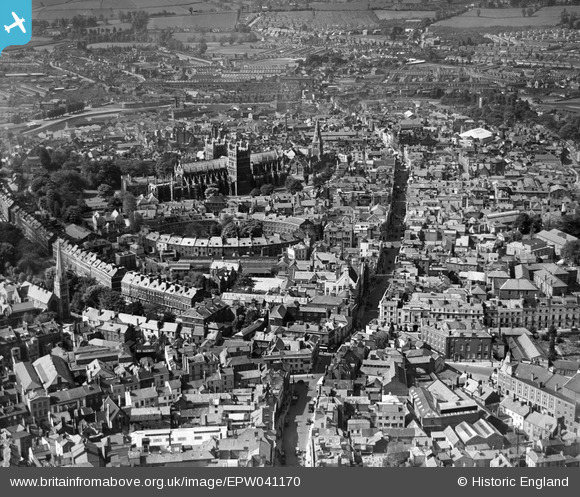 A very good view of St Mary Major Church demolished in the 1970's to improve the aspect of Exeter Cathedral nearby. Cornish's department store on the corner of North Street and Fore Street. Still standing. My grandfather was a carpenter and worked on the Gaumont which was built around 1932. Gaumont Cinema. Identifiable by its huge painted sign on the roof. Of the three purpose built cinemas in Exeter that were constructed in the 1930's, the Gaumont was the earliest when it was opened on Whit Monday, 16th May 1932 by Arthur C Reed MP for Exeter. Built on a site off North Street, it had a grand entrance gate on the street itself that opened into the courtyard in front of the cinema. The site was cramped and had previously been occupied by the Yacht Beverage Co Ltd, a producer of fizzy drinks. The cinema, designed by William H Watkins, could accommodate an audience of 1,499 in what was known as a stadium-type layout in which the stalls and circle were on the same, raked floor. The walls of the auditorium were covered with painted panels showing Medieaval life with a ceiling dominated by a central dome of ribbed plaster and a central light. In common with most other cinemas of the 1930's, it had a grand secondhand, 2 manual, 9 rank Wurlitzer organ installed to entertain the audience between shows and in the intervals, and the 'Ardenie Earphones' system fitted to the seats for the use of the deaf. It was originally called the Gaumont Palace under its owners, the Gaumont British Picture Corporation, who were partners with Albany Ward in the Palladium Cinema, Paris Street. The Gaumont was their answer to the opening, in 1931, of the Plaza in London Inn Square. When, in the 1950's Gaumont merged with the owners of the Odeon, the Rank Organisation, it became known as the Gaumont Theatre. Unlike the Plaza, the Gaumont was purpose built, with its architect, William Henry Watkins FRIBA of Bristol, and designer Percy Bartlett, creating an unusual Scandinavian, Art Deco hybrid. The Gaumont-British Picture Corporation appointed Mr Ralph M Leddra, previously manager of the Palladium, Paris Street, as manager. With acknowledgement and thanks to Exeter Memories. St Lawrence Church destroyed in the war. St Lawrence was one of the churches lost on the 4th May 1942, when the city suffered its worst bombing raid of the Second World War. The church was burnt out, but film taken after the raid indicates the fabric, including the tower, survived. Dating from before the thirteenth-century, it was mentioned in a deed of 1202 when it belonged to the abbot and convent of St Mary de Valle in Bayeux, Normandy. In 1275, Henry III gave permission for it to be passed to the Augustinian priory and convent of Merton, Surrey, who in turn gave it to St John's Hospital at the request of Bishop Peter Quivil. During the Commonwealth, St Lawrence was one of the thirteen parish churches selected for disposal by the Parliamentary Commissioners. It was purchased back by a wealthy parishioner on 21 September 1658, for £100, and returned to the parish, saving it from destruction. Situated on the northern side of the High Street, the church had an enclosed porch with a Norman arched entrance, constructed in 1674, from the materials of an ornamental water conduit that stood close by, in the middle of the High Street. Over the porch, in a Gothic niche, was a statue of Queen Elizabeth I, which was originally sited on the conduit. The conduit displayed the city coat of arms with the date 1590. In 1804, the statue was the subject of a vandal when on 6 May, the head of Good Queen Bess was removed and placed on a spike in front of the church. Mr John Cooke was commended for offering a reward of five guineas for apprehending the offender. 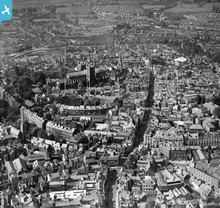 A fantastic view down a heavily shadowed High Street with lots of properties destroyed in the Exeter blitz just nine years later!